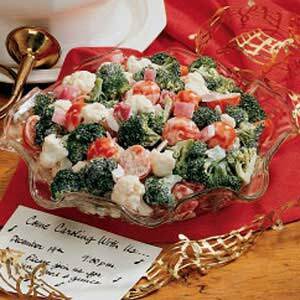 With its creamy dressing and colorful vegetables, this salad is lovely and refreshing. Make it the day before so you have Christmas day free for family and presents! In a large salad bowl, combine vegetables. Whisk the dressing ingredients until smooth; pour over vegetables and toss to coat. Cover and chill for at least 2 hours. Yield: 16-18 servings.